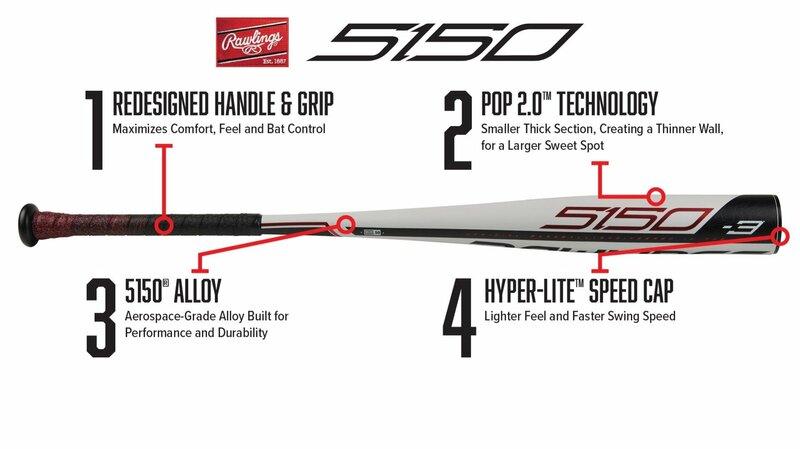 Rawlings releases new baseball bats every season and there is one model that you can always count on being in their latest lineup: the 5150! Crafted for all-around players, the Rawlings 5150 is a classic design and the 2019 model is no exception. With a single-piece construction made up of the radically responsive, aerospace grade 5150 alloy, these baseball bats are built for players throughout the entire lineup. New for the 2019 model is the Hyper-Lite Speed Cap for a lighter feel and faster swing speed and a redesigned barrel profile for an expanded sweetspot and faster swing speeds. Top-of-its-class power, long-lasting durability, and a traditional overall feel are all characteristics you can expect out of the Rawlings 5150 during each at-bat. No matter where it hits in the lineup, it is bound to bring proven performance time and time again. Each model is engineered with the innovative pOp 2.0 technology which creates an even larger sweet-spot and improved feel. Rawlings: Above The Standard! This Rawlings 5150 BBCOR Baseball Bat (BB953) features a drop 3 length to weight ratio, a standard 2 5/8-inch barrel diameter, and the BBCOR certification on the taper for high school and collegiate approval.